The NOXwin Mobile Casino gives you an online casino at your fingertips. Using your smartphone or tablet you can claim casino rewards that include up to £200 free on your first deposit plus 50 Free Spins. Use free casino bonuses to play on over 100 mobile optimised games anywhere within the UK provided you have a reliable internet connection. You will have access to mobile blackjack and roulette plus video pokers like Jacks or Better and Deuces Wild. There are top slots like Foxin Wins, Starburst, Twin Spin and Piggy Riches plus you can even get to play live dealer games on your mobile device. Noxwin is operated and managed by EveryMatrix Software Ltd and is licensed and regulated by the United Kingdom Gambling Commission. Visit m.noxwin.com to play at NOXwin Mobile Casino. If you prefer to play on a desktop computer, you can follow the same link to play casino games and claim bonuses. When you access the NOXwin Mobile Casino you will arrive on a landing page that basically offers you two choices. You can select either the casino lobby or live casino. You will also have an option to add NOXwin.com to the home screen of your mobile device. There is also a big red button giving you the option to open an account. At the very top of your screen, you have the casino logo, a home button and a hidden menu icon. Tap this menu to reveal various options. These include casino games, live casino, sports betting (however this is no longer available), information about NOXwin casino, contact details, help, promotions and further legal details. 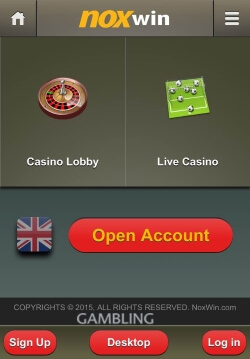 This menu area is available wherever you are on the mobile casino so it can be accessed at any time. Lower down on the screen, you again have the option to sign up or you can log in if you already have an account with NOXwin Casino. Finally, there is an option to view the desktop version of the casino, however, this is not an ideal choice for playing at this casino on your mobile device. When you choose the casino games you then see a series of promotional banners in the top area of your screen. These generally detail current offers and you can click them for further information. Below this section is the games categories. These are all within simple expandable list boxes. Tapping the category of choice will reveal the online casino games you can play that relate to the game type you have chosen. Initially, you will be shown a list of popular casino games. 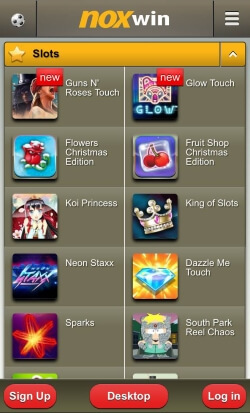 Then you can choose Slots, Table Games, Video Pokers or a list of All Games. Once you have a category open, you just need to tap a game icon and you will be given options to play for fun or play for real. Playing for fun allows you to test out a casino game that you may not have tried before and become confident in how it plays. At any time, you can switch to the NOXwin Mobile live casino games by using the hidden menu mentioned earlier in this review. Within the Live Casino, you can choose several Live Blackjack and Live Roulette games. Each will show what time of day that game is available. Just tap the game you wish to play and it will launch, providing that you are logged in. The live casino games are not available in Freeplay mode. In summary, the NOXwin Mobile Casino is a very good compliment to the main desktop version of the casino. There are plenty of well-known and popular games to choose from and the inclusion of live casino games is a real plus. Unfortunately, after you have played a game the mobile casino tends to forget the language you are using and you may notice it is no longer in English. If this is the case you will need to reload the mobile website in your browser. It is also a bit disappointing that of the dozen progressive jackpots available on the main casino, there are only two available on the NOXwin Mobile Casino, these being Treasure Nile and Major Millions. However, the overall choice is good enough to keep even the most avid online casino players happy. The NOXwin Mobile Casino is compatible with all modern and up to date smartphones and tablets. The games will work better on newer devices subject to the software they use.